Do You Have A Blocked Drains Problem We Can Help You With? Reading Drain Services is an independent, friendly, family-owned business who have been providing drain clearing and drain survey services for both domestic and commercial customers in Reading and the surrounding areas since 2001. 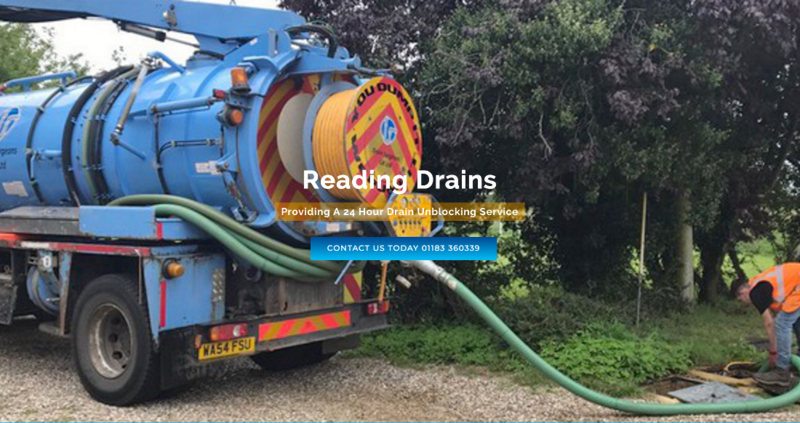 We are now established as Readings expert local blocked drain cleaning company and are renowned for delivering fast and efficient services at a competitive price. Our reputation has been founded on the provision of high standards, reliability and cost-effectiveness. Are you having problems with a blocked toilet, sink or blocked drains in Reading? The problems caused by even a small drain blockage can range from a minor nuisance to a major expensive catastrophe. With our 24 hour drain clearance service whether you have blocked drains a blocked toilet or blocked sewer pipe, day or night, we can usually clear them quickly with our high pressure drain jetting system. CCTV Drain Camera Surveys (Drain Inspection) allows our engineers to investigate complex drainage systems and discover the true condition of your drains quickly and efficiently. By using our state-of-the-art CCTV drain camera we can investigate and locate the cause of any problem such as leaks, clogs, blockages or roots which may have grown into your drain system, quickly and effectively. If you have partially collapsed or damaged drains and sewer pipes, our no-dig or trenchless drain repair or drain relining system is the most cost effective and efficient solution. With no diggers or jackhammers involved we can fix your leaking drain pipe with our epoxy pipe repair system, no matter what type, size or length the sewer pipe is. This will save you both time and money. High pressure water jetting, is the use of water propelled at high speeds to clean both internal and external drains and pipes, it removes debris such as grease, fat, garden and toilet waste, etc. Drain Jetting is a highly effective way of clearing drains, high powered streams of water are pushed through the drain, down into the sewer in order to blast away any debris blocking the normal passage of water. Tree and plant roots commonly cause structural problems in underground drains as the drain provides a source of water, moisture and nutrients. We offer a specialist root removal service if you have roots in your drain. Removing roots from drain pipes is usually done with high pressure water jetting or by using a drain root cutter. Our extensive experience of blocked toilets and blocked sinks more than qualifies us to be able to deal with any drainage problem you might be having in your home, office or workplace. With over 18 years of experience in the industry, we are able to install a brand new septic tank system for commercial and domestic buildings. We arrange installation and repair for all makes and models of septic tanks and our drainage engineers are fully aware of all the current rules and legislation for all installations. Our teams extensive skills and experience in groundworks and construction together with the latest plant and machinery enables us to offer and deliver the quality and service you require. Check that your gutters and drain grids are clear and free of any garden waste or leaves. Garden debris such as dead leaves, twigs etc are one of the main causes of blockages in drains and gutters. This occurs more often in the autumn when most leaves are falling from the trees and we do all of our garden winter preparation. You should always check and clear your drains and gutters of garden debris to stop any accumulation which will eventually cause blocked pipes or drains. The most common cause of blocked toilets is people flushing sanitary items, nappies, plastic packaging, solid objects, cotton balls etc down the toilet. These items can get stuck inside the toilet pipes and then eventually cause a blockage. Its much better to have a bin in your bathroom for your rubbish instead of flushing them down your toilet. Try not to pour fat or anything excessively greasy such as oil down kitchen sinks. If you pour fats, grease or oil into your kitchen sink they can stick to the sides of the drain pipe. Over time, other substances, like bits of hair and dirt, will get stuck in the deposit on the pipes and build up until eventually you have a blocked drain pipe. To prevent this from happening, put fatty and greasy substances into a bottle or jar and throw them in the bin instead of pouring them down your drain. Make sure to keep plugholes free from any build-up of hair and general debris. Hair and other items can end up getting tangled and overtime building up into a mass which can cause a clog in your drain. To avoid this build up, always pick up strands of hair after having a shower, bathing or washing your hair. Also check regularly for any accumulation of materials and remove if necessary. Schedule a regular cleaning regime of baths, toilets and sinks using disinfectant. Bleaches and disinfectants will help to keep the insides of your pipes clean and free from build up of substances that would eventually cause a clogged drain. Raise the lid on drain covers often, to make sure that drains are flowing freely. Checking regularly to ensure that you haven’t got a blocked sewer drain and drainage is flowing freely will alert you early if the drain does become clogged. The earlier you catch a clogged drain the easier the drain can be unblocked. Do You Have A Drain Problem We Can Help You With?